The discs in your back act as a cushion between the vertebrae bones in your back. 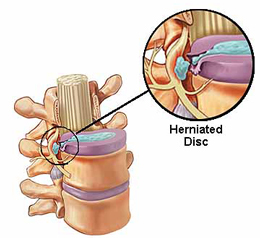 The “herniated” or “prolapsed” disc is responsible for less than 5% of back pain problems. If you suffer from this condition, you will clearly recall when it started. You will have triggered it by an activity (e.g. lifting). You will immediately have become aware of a sharp pain travelling down your leg. What has happened is that the surface of your disc has torn. The fluid that it contains has exuded out of your disc. This resulted in inflammation in your back. A portion of you disc may even be compressing a nerve that travels down your leg. That in turn precipitated your severe leg pain. If your pain is severe, then your first-step in treatment is to attend your doctor. You can get appropriate medication to help you deal with the severity of the pain. After a few weeks your symptoms will have hopefully settled down. At that point, physical therapy treatment can help you to rehabilitate your back to a normal state again. However, your symptoms may not improve after a few weeks. At that point your doctor may refer you for the possibility of surgical intervention if there has been no reduction in the severity of your pain. The herniated disc diagnosis can then be confirmed by an MRI scan. At the Pain Relief Clinic here in Limerick City, our physical therapy treatment brings effective relief to painful conditions and sport’s related injuries. Our treatment is very successful in treating acute injuries/painful episodes and also when confronting chronic long-standing and persistent conditions. During your first visit, we will go over your full case history and also assess your painful condition or injury. Once we have established the primary cause of your painful condition or injury we will address this by treating the appropriate area. Your treatment is typically done through light clothing and is a hands-on treatment. Your session involves applying pressure to your muscles that have been established as being problematic in order to restore your muscle tissue to normality. The pressure applied can vary from light to deeper pressure. However, patient comfort is paramount and the amount of pressure used is determined by your age and suitability. For example, the pressure utilised on an elderly patient would be far lighter than that used on a sport’s person in his twenties. Additionally, some light work may also be done on your joints if necessary. You may also be given some exercise advice to help your rehabilitation. Daily tasks that you were restricted in, or were previously unable to do are now much easier to do. Mr. M. McGarry, Old Cratloe Road, Limerick. The Pain Relief Clinic is situated above O’Sullivan’s Pharmacy in O’Connell Avenue in Limerick City with parking adjacent. You have a choice of morning-time, afternoon and late evening visits. Hi there, my name is Tony Phelan & I’m a Registered Physical Therapist. I travel to the USA every year for advanced training ensuring that you benefit from some of the best physical therapy treatments available in the world today in our Limerick practice. Your session is also covered by VHI, LAYA (formerly Quinn Healthcare), Hibernian Health Aviva (formerly VIVAS) and GloHealth. Your treatment is also eligible for MED-1 Form tax reimbursement. Take steps towards effectively treating your painful condition or injury by calling us today to schedule your treatment in Limerick on (061)467940 or (087)6250992. We look forward to hearing from you and I really hope that you benefitted from the information article. Are you experiencing back pain, neck or shoulder pain, a sports injury, headaches, fibromyalgia or any other painful condition? This is in the business centre just behind Raheen Church. Our unit is located right beside Willow Hair Studio. 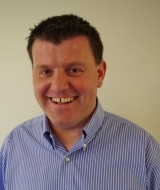 Mr. David Cross, BSc (Hons) is a Registered Physical Therapist. **VHI, LAYA Healthcare, Aviva Health, GloHealth and HSF approved!